Under $1.75 per serving. 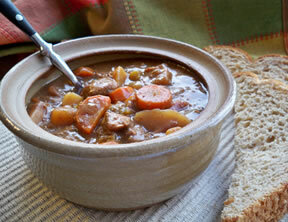 For an easy-to-prepare meal, use McCormick® Beef Stew Seasoning with beef cubes and vegetables in your slow cooker. 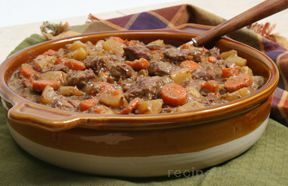 The beef is deliciously tender and the vegetables are infused with a wonderful beef flavor. 1. Mix vegetables, water and Seasoning Mix in slow cooker. 2. Coat beef with flour. Stir into ingredients in slow cooker. Cover. 3. Cook 8 hours on LOW or 5 hours on HIGH until beef is tender. Test Kitchen Tip: For a shorter cook time, more flavor and more tender beef, brown flour-coated beef in 2 tablespoons oil on medium-high heat in large skillet. Drain, if needed. Stir browned beef into remaining ingredients in slow cooker. Cook 4 hours on HIGH.